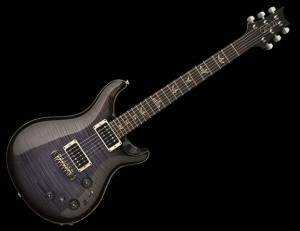 I recently acquired a Purple Hazel PRS P22 to complement my existing arsenal of mag/piezo-equipped stereo guitars. It all started with my Parker Fly Deluxe. 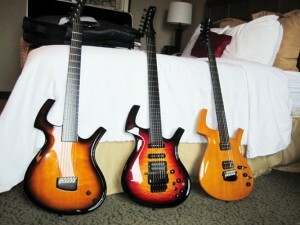 Then I got a Mojo, then a PRS Custom 24 that got a Graphtech Ghost system installed the day it arrived. These were followed by a Parker Custom with Graphtech LB63 Floyd Rose piezo bridge and 13-pin midi hexaphonic as well as a late-model Fly Artist and a Bronze Fly. An American Deluxe strat got the treatment too. All the guitars are routed stereo on stage: electric mag pickup signals go to the amps (lately this is a Kemper KPA, subject of another blog posting here), piezo signal goes to a DI for the house and routes back to an acoustic amp or in-ear monitors, depending on which stage I find myself on. Sometimes when switching the P22 with another P22 or another piezo equipped guitar like a Parker, you may hear a pop. This is particularly bad when your guitars are plugged in to the house PA via a DI box. The popping sound is apparently due to rail voltage used to power the active preamp for your piezo guitars. Funnily enough, the early model pre-refined Parker Fly guitars had this issue solved in the 90’s with their ribbon circuitry. 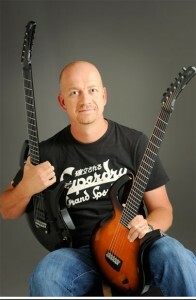 If you plug two of those Parker’s into a stereo switcher like a Lehle, you can switch between the two guitars silently. If, however, you introduce a PRS P22 or a recently built point-2-point wired Parker into the chain, you will probably hear the pop (read BANG if you are plugged into the PA) when you switch the guitars. Sometimes you can experience this pop when switching between piezo and mags on the guitar itself, depending on the quality and integrity of the switch. Im not particularly savvy when it comes to electronics, but the explanation several people in the know have given me about this is that the guitar is unloading unwanted electrical charge, causing the pop. This is also called ‘DC offset’. The way to defeat this is with a capacitor and possibly a balanced resistor in the audio chain. The most logical course of action to solve this issue seemed to my tech and I to be the installation in the guitar itself of a capacitor/resistor combo. I had two of my Parkers wired like this, but it caused problems with the intelligent switching, as the rail voltage was used to switch the late-model Parker pre between mono summed and stereo operation, depending on whether your jack cable plug was TRS or TS. Subsequently I had my tech build me a small box with 2 capacitors in. This seemed to work better, but altered the tone of some of my guitars, thus not 100% desirable. Finally, I discovered a product by Lehle called the DC Filter. 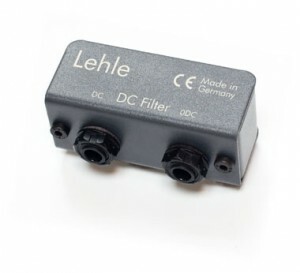 I bought two of these and placed them on the piezo lines of my guitars in the signal chain. Hey presto! That was it – problem solved. Of interest here as well is the fact that I have not detected a significant change in my guitar signal or tone since putting the DC Filters in my rig.